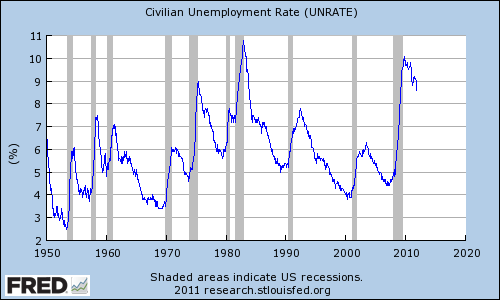 The unemployment rate hasn't been dropping steadily, but it has been dropping. Today it was announced that it has fallen to 8.6%, from 9.0% a month earlier. Even though the unemployment rate is dropping, many of the victims of recessions can still feel the financial crisis currently happening. and home foreclosures is just one of the bad effects of this unemployment and economic recession.